Anybody want an Amnesia clear character poster? These posters are made of plastic, not your typical poster paper!!! They also come with a protection sleeve for each poster!! The posters are 15x42 cm, and the protection sleeves are 16x45 cm. There are twelve types, two for each character, one special prism group version, and a special secret version~~ Will be released in December so available for shipping in January 2014. Let me know if you want one~ Each character poster is $14, and the special prism group poster and secret poster are $15 each. ONE BOX HAS BEEN ORDERED, FEEL FREE TO MAKE YOUR RESERVATIONS! oh hey look, it's my first amnesia preorder I really do love the prism and both Ikki's. 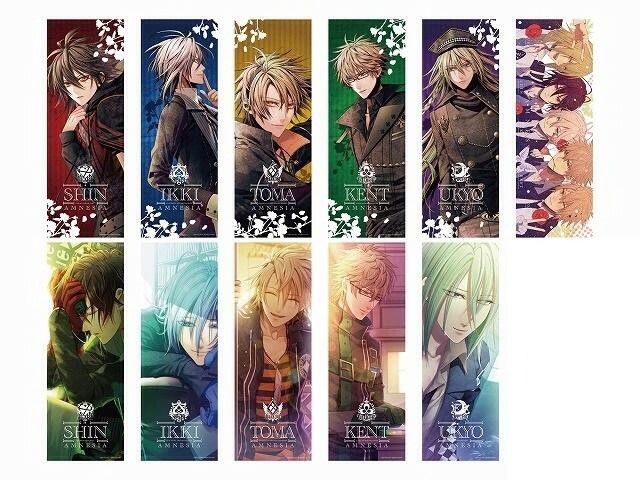 ;w; otome games...why do you have such good art...? They sure are nice!!! Does that mean you want them? I'm a bit confused hehehe... I'll wait to see if anyone else wants them before I order though. Hehehe okie dokie, I'll put those guys down for you!! And where did you drive to?! Oh I know exactly how you feel~ I drive to work everyday only 1.5 hrs a trip but I get so sleepy all the time!!! Be careful! lol I get sleepy driving long trips in the morning and early afternoon, but I love driving late at night though. It's fun and I think I'm more alert in the dark as well.